Mojo Barriers’ core product is based on a simple principle: An A Frame design, with an upright that locks into the base frame and is supported by two diagonal legs at the rear. Quick set up is facilitated by location pins. The sections only require one bolt to connect to the next section .Once in place, stability is provided by the audience weight on the footplate. At the rear of the upright , a step is attached between the two braces, giving security personnel visual and physical access to the crowd. Made of aluminum alloy to cut down on weight both for handling and transportation reasons, the barrier retains its strength through intelligent design. A middle hinged corner section with partial footplate and braces, the Vario allows barrier designs to be shaped in any angle without compromising system strength. This section allows for creating a variable angle in a barrier line, ranging from -60° to +60°. A double hinged corner section without a footplate, the flex is a hinged upright that can be connected to adjoining barrier sections via a male/female integral locator and one bolt. This offers a secure connection with extreme flexibility, varying from -90° to +90° and has an option to vary height and width. Ideal for areas of relatively low pressure. A fixed corner section of 22.5° with full floorplate, double brace and small rear step. ‘Positive’ means moving away from the crowd, usually towards the stage. Nicknamed Pink as its colour mark is pink for easy recognition on site by anyone installing the equipment. The direct opposite of Pink is the fixed negative 22.5° corner section with a full floorplate, double brace and rear step. 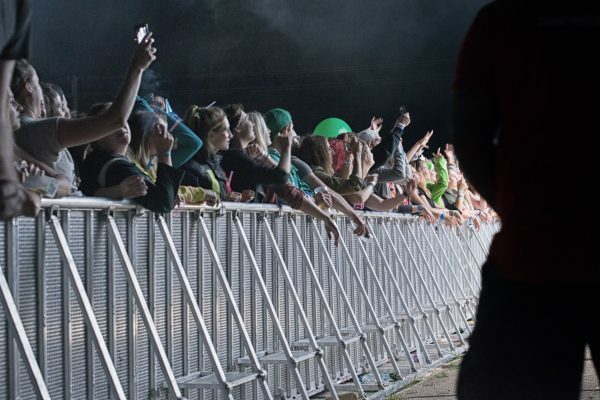 ‘Negative’ means moving towards the crowd, usually away from the stage. Nicknamed White for its white colour mark for easy recognition. Both Pink and White have complete floorplates and braces, ensuring continuous strength of the barrier lines. Furthermore, they can easily be used in combination with other corner sections to design wide and smooth shapes. Colours are present on the braces to make recognition easy. Typical usage would be around catwalks and thrusts in front of a stage. A hinged section to create a door-like opening in the barrier. The snake runner enables crew to feed cables through, allowing multi-cores and power cables to safely cross the barrier section after or during installation or removal (allowing for fast load outs). 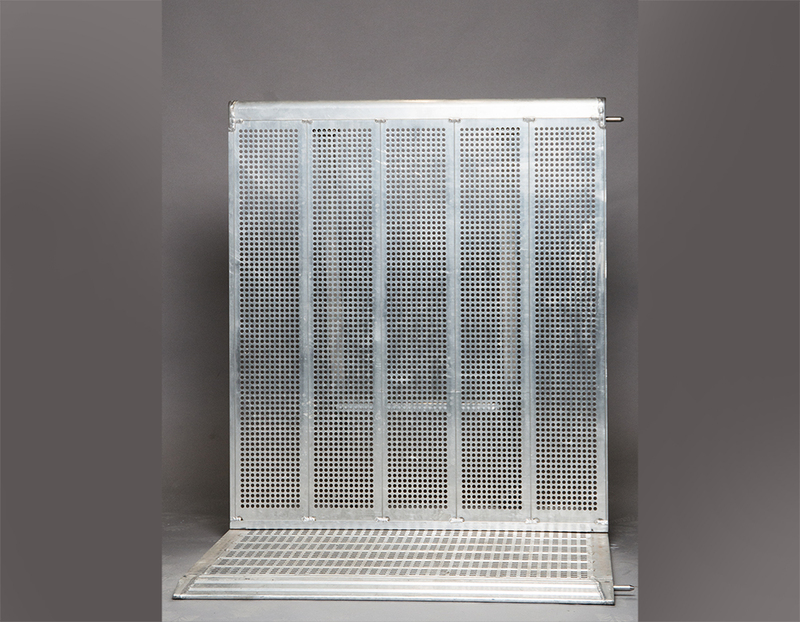 On the fixed vertical part, the floor plate is present, as are the braces and rear step for security personnel. The door of the snake runner has a width of 0.50 m. Ideal for use in front of stage areas. Wider than the snake runner, the snake gate is just that; a gate through which crew are able to feed cables during or after installation or removal. The snake gate can also be used as regular gateway enabling crew to walk through with for example flightcases. 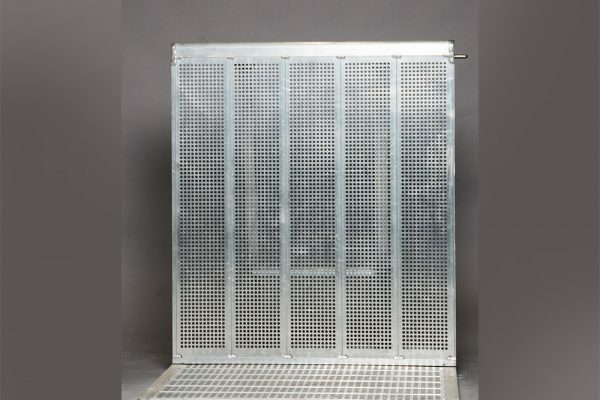 Its door width is 0.85 m and it is ideal for use in an area that doesn’t have too large crowd pressure, for instance, camera platforms or mix positions.